As ruby-throated hummingbirds are returning to the state, researchers are learning more about where they spend the other half of the year. 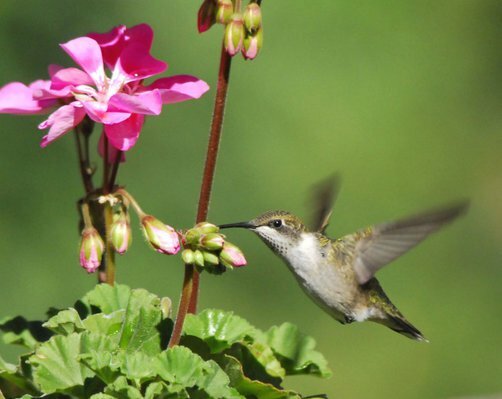 Around the first of May each year, ruby-throated hummingbirds begin returning to the midwest. Wonder where they’ve been all winter? At the end of each summer, some 7 million ruby-throats from across the eastern United States and Canada essentially disappear. There are indications that they travel to the tropics, going as far south as Panama. But hummingbirds are so common in Central America that few people even notice them, much less track them. These little mountain birds also disperse widely, making it even less likely they’d draw attention. So, much of what we know about ruby-throats outside the United States is based on assumptions. A South Carolina naturalist and educator is working to change that. Bill Hilton Jr. has been banding U.S. ruby-throats for decades. Over the years, Hilton and others have slipped tiny aluminum rings on more than 200,000 hummingbirds. Still, none of the banded birds have been reported in Central America. And the value of banding birds lies in them being reported after being caught by another bander or found dead. It’s only when a banded bird is rediscovered that researchers can learn where its band was attached. That, in turn, tells a great deal about a bird’s itinerary. But Hilton isn’t giving up. For the past several years, he’s been leading groups of volunteers to the other end of the migratory trail. In winter, they head to Costa Rica to study and band hummingbirds there. The banders found an aloe vera plantation popular with ruby-throats. By banding a few dozen of these birds over several years, Hilton could tell that the same ruby-throats were returning from year to year, a practice called “site fidelity” in ornithological circles. To date, an estimated 400 ruby-throats have been banded on their tropical wintering grounds. That’s a small percentage of the estimated population. But the banding work has already proved its worth: The birds that return each year to the aloe plantation send a strong message about conserving such sites. “Site fidelity like this gives us pretty powerful evidence when we talk about the need to protect the birds’ habitat,” said Hilton. And, in the summer of 2008, Hilton got some exciting news. A bird he’d banded in Costa Rica had turned up in the United States. This hummingbird, encountered in Georgia, was the first-ever ruby-throat banded in Central America to be captured in the United States. That makes it the first hard evidence that ruby-throats migrate back and forth. If you’re a hummingbird fan, you can help learn more about these birds. Here’s how: If you come across a ruby-throat with a band on its leg, contact the federal Bird Banding Laboratory. Either fill out a form on its web page (www.pwrc.usgs.gov/bbl/) or call 1-800-327-BAND. They’ll ask for the band number and where the bird was found, and report this information to the original bander. If you’d like to join one of those winter bird-banding trips to the tropics, go to www.hiltonpond.org and click on hummingbirds. Val Cunningham, a St. Paul resident, writes about nature for local and regional newspapers. She’s also the author of “The Gardener’s Hummingbird Book.” She can be reached at valwrites@comcast.net.